As seen in the theology described above, one of Ptah’s dominant roles was that of creator, He was described as the god “who has made all gods, men, and animals- he who has created all lands and shores and the ocean in his name ‘fashioner of the earth.’ ” As heart and tongue of the Ennead, he was both the origin of intelligence and the means of communicating it. He was both the spokesman who issued the words and the artisan who forged part of the creation. As a result, Ptah God was the patron of all those who create handicrafts and work with metal or stone. He was the great artificer of Egyptian mythology. 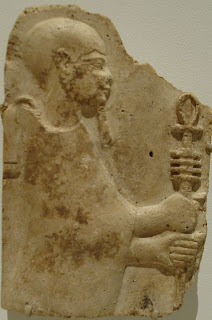 Ptah God was later to be associated with numerous other gods, especially Sokaris and Osiris, both of whom were connected with death. His mummy like dress further emphasized his role on behalf of souls in the underworld. Ptah God was considered Lord of the Year measurer of time, but timeless himself: “I am yesterday, today, and tomorrow for I am born again and again. I am the Lord of Resurrection who comes forth from the dusk and whose birth is from the House of Death.” The Book of the Dead makes Ptah God responsible in the underworld for using an iron knife to open the mouth of the recently dead person, an act that was supposed to restore the use of the senses. Like most gods, Ptah God was also viewed as protector of those who worshipped him. A tale from a Ptolemaic manuscript relates the adventures of Setna, Ptah’s chief priest during the Nineteenth Dynasty. The story deals with historical characters Ramses II and his son Setna Khaemuast, who was a worthy soldier as well as chief priest. He died before his father and was buried at Sakkara. This moral fable, closely linked with the one concerning the Book of Thoth told in a later chapter, presents a rather human view of the famous prince who had to learn to respect the power of magic and to practice proper humility. As soon as the talisman was placed on his head, Setna jumped free, grabbed the Book of Thoth, and ran from the tomb. As he did, the light of the tomb went with him and Neferkaptah and his wife were left in darkness. When Setna displayed the book to Ramses, the king warned him of its dangers, but the high priest unrolled the book and read it to all who would listen. Later, while walking through the Temple of Ptah God at Memphis, Setna spied a beautiful woman. He sent a servant to inquire about her and soon discovered she was Tabubu, daughter of a priest of Bastet, and had come to worship Ptah God. Boldly Setna sent the servant back with an offer of ten pieces of gold if she would sleep with him. The woman replied that she was a lady of rank, but that 1 Setna came to her home at Bubastis there would be no risk of discovery. By boat Setna hastened to his rendezvous. Once he found he house, he was conducted upstairs to a richly decorated room with both dining tables and couches. He and Tabubu spent the day j agreeable discourse and feasting, but the more Setna observed her beauty, the more he hungered not for her food but for her personal delights. When he begged her to yield to his desire, she reminded him that she was a lady of rank, and said she would consent to his wishes only if he would sign a letter promising to maintain her and to make over all his property to her. Without hesitation he called for a scribe and signed away his worldly wealth. Tabubu put on a diaphanous robe that clearly revealed her promised charms. Setna’s desire grew more impatient, and shrewdly Tabubu used her advantage. She ordered his children be summoned, in order that they might sign the letter too. Without hesitation Setna made his own children add their names to the document giving up their birthright. Inflamed with passion, he then turned to Tabubu for relief, but once again she held him back. “Now kill your children,” she ordered, “so that they cannot fight with my own children over your property.” Too far gone to stop now, he had his own sons and daughters slain and their bodies thrown out of the window. As the dogs in the street tore at their tender flesh, their father sought his satisfaction. Tabubu led him to a bed of ivory and ebony. He undressed, exposing his physical excitement. As last he was about to claim the promised joys for which he had paid so dearly. He reached out to take her in his arms and suddenly she let out a scream. In an instant he found himself alone, naked, and aroused. It was as though he had awakened from a dream. At that moment Ramesses happened to ride by and Setna knew he ought to stand up out of respect, but his physical condition made him embarrassed to do so. The king nevertheless saw his son and chided him: “Why are you in this shameful state?” Setna finally understood that Neferkaptah had enchanted him, and to his father the story. Ramesses advised him to return to Memphis where he would find his children unharmed. He also suggested that his men clothe the self-conscious prince. After Setna was reunited with his children, Ramses reminded him he had been warned not to take the Book of Thoth. The only salvation was to return it and do penance. When Ptah’s chief priest re-entered the tomb, bearing the book, Neferkaptah’s wife was overjoyed to see him although the two kas had obviously relished his discomfiture. She told the high priest, “It is Ptah God, the great god, who has brought you back safe.” Her husband was less kind, remarking. “It is your own fault; this is what I warned you about before.” As a penance Neferkaptah sent Setna to find the bodies of his wife and son and bring them to join their spirits in his tomb. Once he had accomplished this task and placed the book between husband and wife, the tomb was again filled with light. This kinda helped me but it also didn´t....If you can...please add more facts it would help alot! !